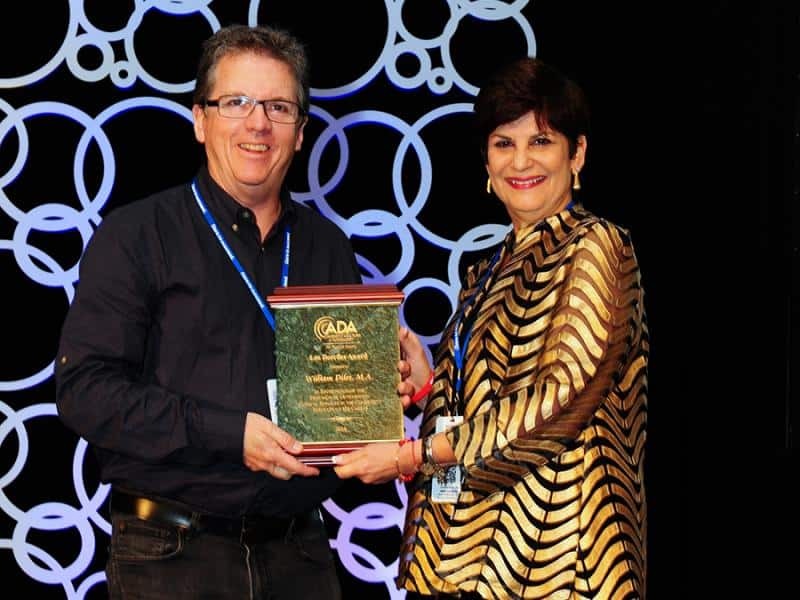 On Saturday, November 12, 2016, Bill Diles was presented with the Leo Doerfler award at the ADA Audacity convention in San Diego, CA. The Leo Doerfler Award is given to recognize an audiologist who has demonstrated outstanding clinical services in the community throughout his/her career. You can read more about the award, its history, and its namesake here. I have been a colleague and friend of Bill’s for many years, and he has always given me sound advice for my business. One thing he has said to me is that the best things he does in his practice he does outside his practice. When it comes to community service, Bill shines in 2 arenas, Hospice care and Hearing loop installation. About 5 years ago, Bill started a Hospice Program in his community, wherein he fits hearing aids to people receiving Hospice care, and he does it at no charge to the patient or their family. Most of us have been in touch with Hospice organizations at one point or another through a loved one’s experience and have seen the amazing work that these nurses, doctors, and social workers do for patients and their families. Bill recognized that being able to hear during these difficult and important days is critical, and that patients are often not in a place to invest financially in their hearing, so he makes it possible to them at no cost by using donated devices (from manufacturers or other patients) and offering up his own time and that of his staff audiologists and hearing aid dispensers. Audiology Today featured him in a recent article about Hearing Care at the End of Life. Additionally, Bill is a great advocate for access for his patients in their community, as he has looped more than 3000 homes, dozens of churches, and 9 movie theaters – again at no cost to his patients or these businesses. I love how Bill is actually changing environments in his community where his patients live, worship, and enjoy spending free time. While both his Hospice program and looping surely reap benefits for his business, I know Bill well enough to know that he would do them even if they didn’t – that’s how much he cares about his profession, his community, and his patients. We are so proud of Bill and the great work he has done in his community for 35 years. If you’re interested in talking with him about starting a Hospice program in your area, installing loops, or other unique ways of helping patients in your community, please get in touch with us.